Mil-Rugged, High-Sensitivity InGaAs SWIR Camera. Product at end of life cycle. Consult the factory for availability. The compact SU640HSX is a Mil-Rugged InGaAs digital video camera featuring high-sensitivity and wide operating temperature range. 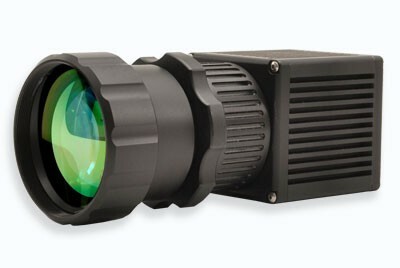 This camera provides real-time daylight to low-light imaging in the Short Wave Infrared (SWIR) wavelength spectrum for persistent surveillance, laser detection, and penetration through fog, dust, and smoke. In addition, the camera employs on-board Automatic Gain Control (AGC), proprietary dynamic-range enhancement technology, and built-in non-uniformity corrections (NUCs), allowing it to address the challenges of urban night imaging without blooming. Simultaneous RS170 analog and Camera Link® digital output provide a means for plug-and-play video and high quality 12-bit images for transmission and image processing. The lightweight, compact size, and low power consumption enables easy integration into surveillance systems, whether hand-held, mobile, or aerial. Optional NIR/SWIR technology is available to extend the sensitivity of Sensors Unlimited cameras to below 0.7 μm, offering the advantage of both Near Infrared (NIR) and Short Wave Infrared wavelength response. Instructions: adjust the number of rows to determine the maximum frame rate for a given window. Frame rate does not change with number of columns on this camera. * λ = 1.55 µm, exposure time = 33.2 ms, Highest Sensitivity OPR setting, no lens, x1 digital gain with enhancement, AGC, and correction off. ** In high dynamic range OPR settings. Able to achieve 1000:1 in high sensitivity OPR settings.